"Sampath Speaking" - the thoughts of an Insurer from Thiruvallikkeni: Klepetan, the Stork flies back thousands of mile, every year - for 14th year. Klepetan, the Stork flies back thousands of mile, every year - for 14th year. In Mar 2016, at Madurai, there was this interesting incident. A stork came to the 'Potramarai Kulam' (Golden Lotus tank) on a Friday and remained there till Wednesday evening. Temple staff provided shelter by tying an umbrella to a pole; sadly, it died after 5 days…. and was buried by the temple authorities near the gosala on the temple premises after rituals were performed. The famous tank at Madurai Meenakshi Sundareeswar temple has no fish and there is a legend attached to it - that of a stork pleading Lord and getting mukthi too. Storks are large, long-legged, long-necked wading birds with long, stout bills. Storks dwell in many regions and tend to live in drier habitats. Many species are migratory. Most storks eat frogs, fish, insects, earthworms, small birds and small mammals. Previous studies showed that the birds made pit stops at landfills while migrating south. But this was the first study to confirm that some storks, enticed by the year-round buffet, are taking up permanent Portuguese residency. Some of their favorite menu items, the researchers found, were rotten fish, leftover chicken and hamburgers. They also observed the birds munching on rubbish like computer parts and bits of paper. A very high percent of all bird species are monogamous. Monogamy is defined as one male mating with one female and forming a "pair bond." Presumably monogamy evolved in situations where young have a much better chance of surviving if both parents cooperate in rearing them. – here is something on the ultimate lovebird – a Stork that flies to the same rooftop in Croatia every year for 14 years to be reunited with its crippled partner who cannot migrate after it was shot by a hunter. 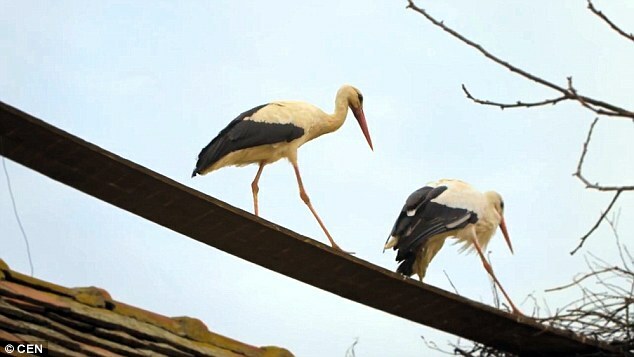 MailOnline reports of a stork that has melted hearts in Croatia by flying to the same rooftop every year for 14 years - to be reunited with its crippled partner.The faithful bird, called Klepetan, has returned once again to the village of Slavonski Brod in east Croatia after a 5,000 mile migration. He spends his winters alone in South Africa because his disabled partner Malena cannot fly properly after being shot by a hunter in 1993. Every summer, the pair bring up chicks, with Klepetan leading their flying lessons in preparation for the trip south in summer. Klepetan spends his winters alone in South Africa and makes the 5,000-mile journey home every year, for the 14th year in a row now. His love, Malena had been found lying by the side the road by schoolteacher Stjepan Vokic, who fixed her wing and kept her in his home for years before helping her to build a nest on his roof. After placing her there, she was spotted by Klepetan 14 years ago. And now every year they are reunited in the spring. Stjepan Vokic, whose roof the couple nest on, has taken care of Malena since she was first injured by hunters and says that she - like her partner - is now part of the family. During the winter, Vokic keeps her inside the house, and then lets her go to the roof each spring where she patiently waits for her partner. Klepetan keeps a very strict timetable, usually arriving back at the same time on the same day in March to be welcomed by locals. But this year he was running six days late, causing panic among local media and fans of the stork couple. Such is the popularity of the pair that there is even a live feed on the main square in the capital Zagreb showing the two storks. There was huge excitement when stork-watchers saw what they thought was Klepetan circling over the nest, and then coming in to land. But the new arrival turned out to be a different stork that was attempting to woo Malena. She quickly attacked him and drove him off and continued to wait for Klepetan. She does have the ability to make very short flights but her wing has not healed well enough for her to make the trip to Africa, or even to properly feed herself. Every summer, the pair bring up chicks, with Klepetan leading their flying lessons in preparation for the trip south in summer. The oldest recorded living stork was 39. Locals are hopeful the couple's long relationship will continue for years to come.